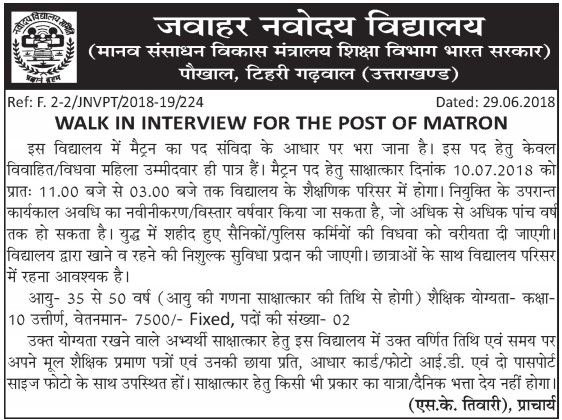 Jahawar Navodaya Vidyalaya Pokhal Tehri has released the advertisement for the recruitment of Matron. This post is on contractual basis for one year but can be resuming further but not more than 5 years. Department invites candidates for Walk in Interview for Matron Post on 10th July 2018. This post is only for Married / Widow Women’s. Selection of candidates will be made on the basis of interview marks. Interested candidates may appear in walk-in Interview on 10th July 2018 at School Campus of Jawahar Navodaya Vidyalaya Pokhal, Tehri. Candidates are requested to bring their original certificates of educational qualification, one set of self-attested photocopies of all the documents, Adhar Card, Photo ID and 2 passport size photos. Walk-in Interview Date: 10 July 2018 from 11:00am to 03:00pm. Help us to improve this article/job posting "Walk-in for Matron Post in Jawahar Navodaya Vidyalaya Tehri". We would be glad if you can comment below and provide your valuable suggestions and feedback. If this page have any wrong information/list or out of context content, then you can report us as well.